Rum and fire. They go together like peanut butter and chocolate, or burgers and fries. But I’m here to tell you to stop lighting your rum on fire. Sure, if it’s tasteless Puerto Rican 151 proof rum, go ahead. The less high proof vodka-in-disguise, the better. Just don’t expect setting your rum ablaze to make an awesome chalice of fire, practically a legal requirement for any volcano bowl at a decent Tiki bar. I’ve realized recently that within the mixology world there are two tribes: The professionals who work at a bar and passionate amateurs, the “home bartenders”. Most experience with spirits and technique are shared by both tribes. I’m firmly on the home bartender side but I can converse with expert bartenders about many topics. When it comes to creating drinks at scale however, thinks are very different. A professional bartender needs to quickly make many drinks quickly, so the bar is set up for that. Ice is an arm’s length away, ingredients such as fresh lime juice are prepped beforehand and in easy-pour bottles, and dedicated rinsing devices speed up the turnaround time on each cocktail. When I watch my professional friends behind the bar I wish I had those sort of conveniences. However, without dedicating a fairly large amount of space and money, I know it’s not feasible in my home bar. The space I have is roughly six feet by five feet, but I’ve packed in a few essential “power tools” which raise my cocktail making ability several notches above the guy with an ice cube tray, a lime and a couple of tumblers. Expanding the Tiki Lexicon – Coffee flavor in Falernum? One day as Jason Alexander and I were doing our usual Facebook chatting about all topics rum and Tiki, we were both lamenting that with 70 years of history and a well-established set of ingredients, it can be difficult to really innovate in the Tiki space. Sure it’s fun to make classics and tweak things with latest rums, spices and syrups, but sometimes you just want a new flavor “toy”. Falernum is a canonical Tiki ingredient and it’s a grab bag of flavors – Clove, lime, ginger, and almond are the basics, plus lord knows what else people add to their homemade concoctions. Yes, falernum seems like a ripe place to introduce a new flavor element. I’ve long thought that the flavor of coffee fits well within the flavor profiles of other Tiki ingredients – strong and spicy. Think allspice dram, cinnamon syrup, vanilla, and so forth. While coffee flavors occasionally show up in Tiki recipes, those recipes are relatively rare in the canon of Tiki recipes. Although it might seem odd at first, adding coffee flavor to the falernum stew makes sense. All the traditional falernum ingredients, as well as coffee are found in the Caribbean; Jamaica is famous for its Blue Mountain coffee beans. And while coffee is a strong flavor that might ordinarily dominate some infusions, clove, ginger and lime are no slackers in the strong flavor category either. With that in mind, Jason and I decided to try making a falernum with coffee and immediately realized we had different ideas about to achieve it. In the context of Tiki and syrups, coffee is unusual in that its flavor essence is easily extracted by water, and we have a long history of doing so. This was the approach Jason thought of – Make a strong espresso and mix it with sugar to make a strong coffee syrup that’s then added to the infused rum component in place of the normal 2:1 simple syrup. My thought was to treat the coffee like the clove, ginger and lime peels – grind it and add it to the rum base to let the alcohol do the flavor extraction. As I write this, Jason has his Coffee-Falernum ready and has been using it at the Tacoma Cabana. My rum infusion is still brewing, and tomorrow I’ll finish it off before taking it down to Tacoma where Jason and I will compare/contrast the flavor. If either or both of them pass muster, I’ll update this post with the results and recipes. Jason and I tasted the falernums down at Tacoma Cabana last night. We both agreed that Jason’s turned out a little bitter, but this wasn’t due to the coffee itself. We both attributed it to the lime peel, with backing evidence from Jason’s normal falernum. When he made his coffee falernum, he simply set aside a small amount of the rum brew to mix with the espresso syrup. Jason’s going to continue experimenting with his method however. I was pretty happy with my falernum, although the coffee element was stronger than I’d hoped for. About 2 seconds after adding the coffee to the rum brew I wished I’d added less ground coffee. Nonetheless, the final result showed promise. You get the coffee taste up front for a few seconds but it then rapidly segues to the traditional falernum flavors (lime, ginger, clove). In my recipe below I’ve reduced the amount of ground coffee to bring down the initial coffee flavor dominance. Crush the cloves, then toast the cloves and almonds on a cookie sheet or aluminum foil in an oven at 325 degrees for ~5 minutes. Let cloves/almonds cool before adding them and the ground coffee to the rum in a sealable jar to form a brew. Let sit for 24 hours. Add the lime and ginger to the brew. Let sit for another 24 hours. Prepare the 2:1 simple syrup with the sugar and water. Strain the rum brew through cheesecloth or other fine filter into the simple syrup. Stir well. After the taste testing, Jason made two Castaways, one with his falernum, the other with mine. The one using mine was quite tasty – I’ll be making that one at home. Author Matt PietrekPosted on June 6, 2014 June 2, 2018 Categories cocktail recipes, Cocktail Technique, tikiTags falernum, Tacoma Cabana2 Comments on Expanding the Tiki Lexicon – Coffee flavor in Falernum? I realize that what follows may be heretical in Tiki circles. It might go against 80 years of Tiki lore, secret recipe books, and exotic rums as described by Beachbum Berry in his book, Sippin’Safari. But, the simple truth is that a tasty Tiki libation isn’t hard to improvise if you know the basic pattern and have a reasonable set of ingredients on hand. Let me be completely clear up front – I’m an avid collector of tiki recipes, and with 50+ different rums and many exotic syrups in my collection, you’d be hard pressed to find a recipe that I couldn’t fashion reasonably well with what I have on hand. I firmly believe that a tiki drink should be as authentic and well constructed as possible and I regularly consult many recipes in my extensive notebook. However, you shouldn’t feel constrained to slavishly implementing existing recipes, or worse, not making a drink at all because you don’t have every ingredient the recipe calls for. Think of tiki as a rich framework for improvisation – Discovering new flavor combinations that work well together. Using the following guidelines you can easily come up with your creation or a spin on an existing classic. 2) Tiki drinks have lime juice. You might find a few that use lemon, but without one or the other it’s not really tiki. 3) Tiki drinks may have other fruit juices, but it’s not required. The most common juices found in tiki are pineapple, grapefruit and orange juice. Personally I shy away from OJ in my tiki as it just feels too cliché. 4) Tiki drinks should not overly sweet. It’s easy to throw a bunch of syrups and sweet liqueurs into a drink and end up with an overly sweet mess with a muddled flavor. Don’t do this. 6) Tiki drinks are traditionally served over crushed ice. If you don’t have an ice crusher, use a mallet, a kitchen towel, or whatever gets the job done. The key element of creating your own Tiki recipes is balance. You should be able to taste every ingredient to some degree. Don’t cover up the flavor of the rum. Ensure there’s some tartness from the lime juice. Don’t throw so many flavors in that you can’t discern what’s what anymore. One area where I diverge from accepted tiki wisdom is going with 3 or more rums in a drink. Yes, it sounds awesome (“Four overproof rums – YEAAAH!! !”), but unless you have an amazing palate you’re not going to discern the distinct flavors of each rum. For that reason I tend towards using just one or two rums – A strong Jamaican like Smith & Cross by itself, or in combination with an Agricole style are particular favorites of mine. Between 2 and 4 ounces of rum, depending on the quantity of other ingredients. Between .5 and 1 oz of lime juice, depending on how much sweet you add. If using other fruit juices, an ounce is a good starting point. Between .5 oz and 1.5 oz of syrup and/or sweet liqueur. If you go with a lot of sweet, bump up the lime juice to compensate. If using a strong bitter flavor such as allspice dram, go easy on it. I typically use 1/8 to ¼ oz. For angostura bitters, 2-4 dashes is usually plenty. Using falernum requires thought to maintain balance as there are different falernum styles. Homemade falernum has sugar, but the lime and ginger pull it towards the bitter side in my opinion. Non-alcoholic falernum syrup and Velvet Falernum leans towards the sweet side of things.. This is classic tiki at its finest, albeit very simple. Note there’s no fruit juice beyond the lime, and no bitter flavor components. There are three sweeteners, but a whole lime provides a lot of tart to compensate. As for the Wray and Nephew 17, good luck finding that. As mentioned earlier, you have a lot of latitude with rums. For a proper Mai Tai I’d sub in another fine Jamaican style rum – The funkier the better. This is tiki purgatory. No lime juice – What the hell??? Rum with no discernable flavor. No balance. A sugar bomb. The tiki gods will hunt you down if you order this. This is a personal tiki favorite and a great example of my guidelines. It utilizes something from each ingredient category: Plenty of flavorful rum, lime juice, fruit juice, flavored syrups, liqueurs, and multiple bitters. While a delightful drink and a great basis for improvisation, the daiquiri isn’t a tiki drink by most standards. Rum and lime, sure. But no flavored syrups/liqueurs, no other fruit juices, and no bitters. The daiquiri is too simple to be tiki. I call it a “tropical” drink instead. The Pina Colada is one of the first drinks I made when I came of age. I genuinely enjoy them, but they’re not tiki by the definition above. There’s no tart citrus of any form. Also, they’re traditionally blended, which goes against the crushed ice guideline. Like the daiquiri, I put this in the tropical category. Starting from the tiki guidelines, it’s fun to try out new things – break a rule or two along the way. One of my favorites is to substitute in mezcal for the rum. Another is to experiment with introducing flavored amaros like Fernet or Campari. Leave comments with your own ideas! A well-established maxim in mixology circles is that bartenders should keep a notebook of recipes they’ve made, experiments in progress, and so on. Usually this is the form of a small spiral notebook or index cards. I completely agree that if you’re passionate about mixology, a good repository for your experiences and ideas is essential. What I disagree with is the archaic method of writing down by hand every worthwhile recipe or scrap of information. Notebooks can easily be misplaced, spilled on or any number of other calamities. Plus hunting for that one recipe with that one ingredient is tedious at best. It’s a free on the web, and runs in your browser – All you need is a free live.com account. It has free mobile apps for IOS, Android and Windows Phone. Any addition or change you make in one location seamlessly appears everywhere else. Searching for anything (cocktail names, ingredients, etc..) is trivial. The desktop version of OneNote rocks and is included in the Office suite – You may already have it. Although I’ve never used EverNote, I believe it has similar functionality so you can probably substitute Evernote for what follows. 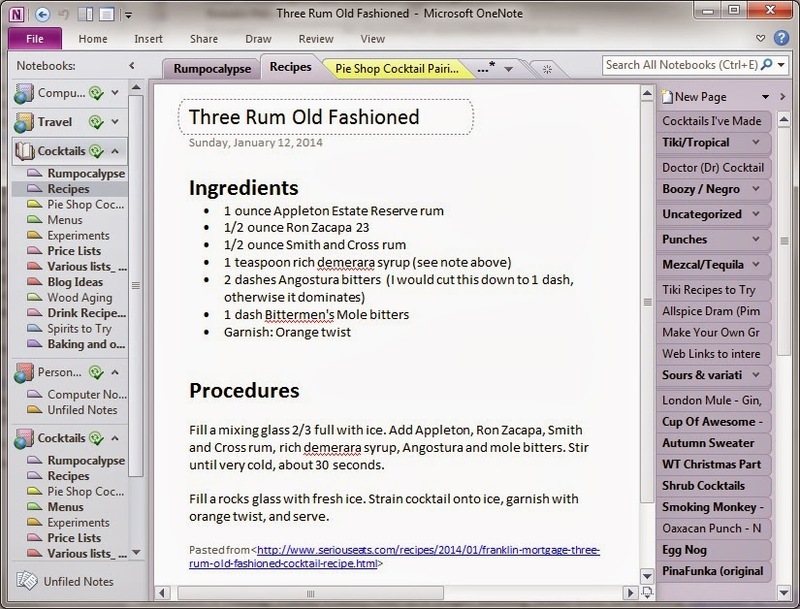 My main use of OneNote is recording each new cocktail recipe the first time I make it. It’s then really easy to look up later, perhaps when a friend is over and I want to show off the drink. Each cocktail typically gets its own page. The exception is when I’m working on a recipe and have multiple iterations. Entering recipes is really simple. If it’s my own recipe I just type in the ingredients. If it’s a recipe on the web, a simple copy/paste does the trick, and as a bonus I get the original page URL automatically. I usually include my impressions, and suggestions for what I might do differently next time. I have X. What can I do with it? Recently we had fresh grapefruits that needed to be used soon. What had I made with grapefruit previously? A quick search turned up every recipe I’ve made that uses grapefruit. The same goes for ingredients. Maybe you just got a new Old Tom gin, for instance. What can you do with it? Suddenly you’re the bartender! At gatherings, people sometimes recall that I’m pretty good with a shaker and I’m now facing a random collection of spirits and mixers and expected to produce magic. What can I make? With OneNote on my iPhone I have a fighting change of finding a trusted recipe using the ingredients at hand. The right device in the right place. Adding text on a phone is slow and error prone. I usually add recipes on my laptop upstairs, or sometimes on the iPad. But when I need the recipe I’m usually at my bar downstairs. Rather than running back and forth to the computer or trying to find space for my iPad on my bar, I just grab my iPhone knowing that the recipe is synced to it. Long story short, a notebook is an incredibly useful tool, but even though you enjoy pre-prohibition era cocktails doesn’t mean you have to suffer with pre-prohibition era tools. A little effort here pays big dividends.